Members of Kuwait's women's ice hockey team take part in a training session at the ski lounge in Kuwait City on September 29, 2017. 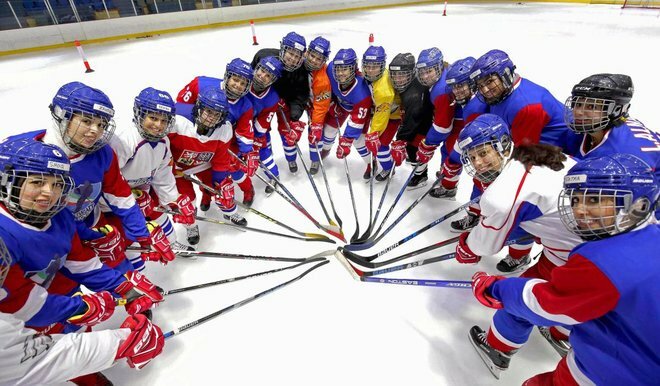 KUWAIT CITY - In their red, white and blue uniforms, Kuwait's first female ice hockey team is training hard in the desert ahead of their debut world tournament later this month. Affectionately dubbed the "ice ladies" by local media, athletes in hijab or with their hair hastily tied in topknots pull on their helmets before taking to the rink in the Kuwaiti capital -- where temperatures top 40 degrees Celsius (104 Fahrenheit) on a sunny October afternoon. "It's totally new, girls playing this sort of demanding sport here in Kuwait and in the Gulf, but it goes to show that in sports there is truly no difference between men and women," said team player Bahar al-Harban. Women on ice have grabbed headlines in the Gulf this year, with UAE national Zahra Lari gaining popularity on social media -- and through a Nike campaign in the Middle East -- as the Emirates' first female figure skater and the first international figure skater to compete in hijab. Kuwait's women's ice hockey team will play their first international game on October 30 at the Ice Hockey World Championship in Bangkok, according to the state-run KUNA news agency. Fifty-six Kuwaiti women between the ages of 15 and 30 are now the proud owners of team jerseys emblazoned with their names on the back -- some of them mothers who frequently bring their children to training. But while the athletes have the support of their teammates and, increasingly, of their communities, what they lack is their own training facility. For now, they still rent the ice rink in a state-run ski lounge. "We need facilities dedicated to training women to convince families that that their daughters need to be involved in sports," said Sheikha Naima Al-Sabah, president of the Kuwaiti Women's Sports Authority. "We initially faced some resistance due to social traditions, but the culture of women in sports is spreading and we're not regular faces at Asian tournaments," she told AFP. "So we are progressing, but slowly, because some of our girls immediately marry at a certain age -- or because they choose to wear hijab in a world where you're not allowed into certain sports if you choose to wear hijab". International basketball governing body FIBA in May rescinded a ban on hijab and other forms of religious headcovers, which on the grounds that they could potentially fall off and pose a risk to players. But with its oversized jerseys, shin guards and helmets, hockey is a good fit for many of the Kuwaiti national team players. "As you see, the uniform totally covers everything," said team player Khaleda Abdel Karim?? during a break in practice. "So I personally find no difficulties at all in that sense," she smiled, adding that the team had received strong support from both Kuwait's government and the public. Despite the warm welcome the team has received, the women are still fighting to both secure the best for their athletes -- and to overcome culture challenges both at home and abroad. "In order to get the best results, you need to be given the best training," said Sheikha Naima of the sports authority. "What we need are good coaches, professional trainers. I don't want... just any coach? for my girls". In their red, white and blue uniforms, Kuwait's first female ice hockey team is training hard in the desert ahead of their debut world tournament later this month.